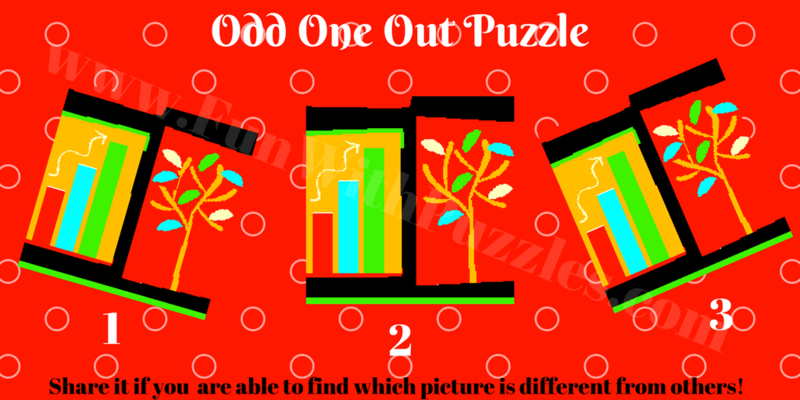 Fun With Puzzles Brain Teasers Brainteasers Kids Puzzles Odd One Out Picture Puzzles Picture Brain Teasers to find which Picture is different? Picture Brain Teasers to find which Picture is different? Finding the Odd One Out has been very liked puzzle type on this website. There are a different variety of puzzles in this type. In some puzzles, one has to find which is the Odd Object Out in the given group of the similar looking object. In some puzzles, one has to find out which Letter is Odd One Out among the given set of letters. 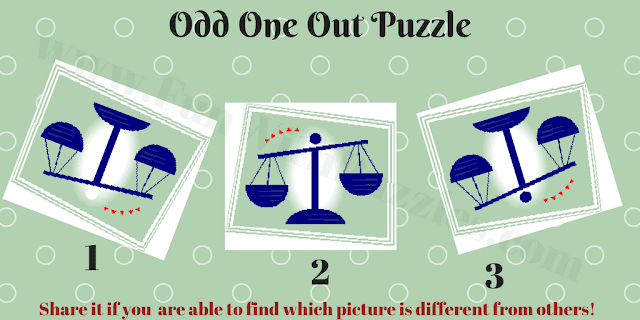 In some puzzles, one has to find which Number is Odd One Out among the given set of numbers. 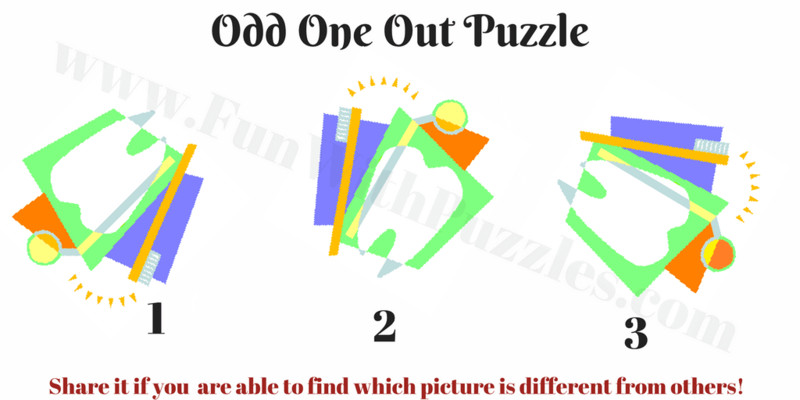 However, some puzzles are Math Odd One Out puzzles in which one has to do some Mathematical calculations to find out which is the Odd one Out. 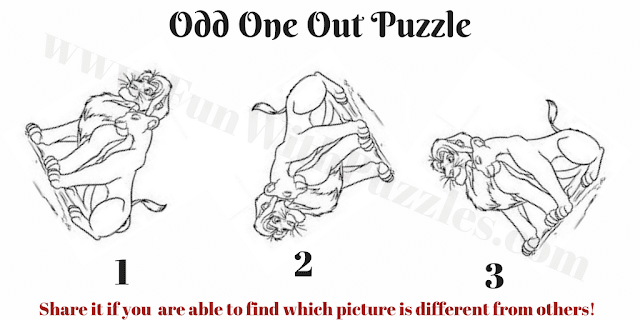 Today's Odd One Out puzzles is Picture Brain Teasers in which three similar looking pictures are given. These pictures are rotated with respect to each other. One has to find out which picture is different from the other two pictures. Remaining two pictures will be exactly alike and there will be a very small difference in the third picture. One has to find out this third different picture. 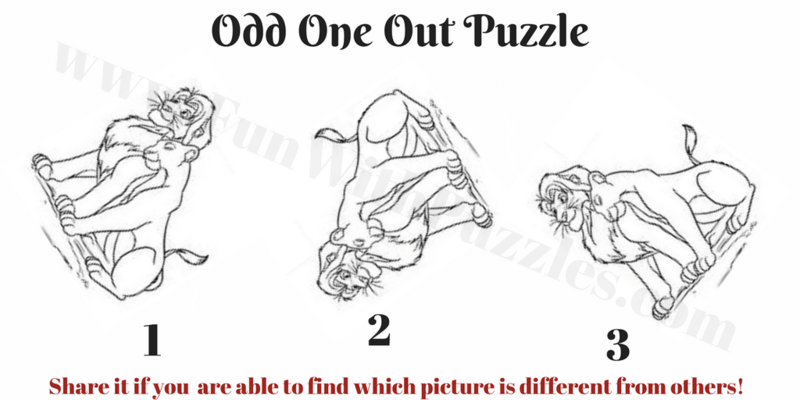 Let us see how fast you can find which picture is different among the given set of 5 puzzles? 1. Picture Brain Teaser to find which one is different? 3. 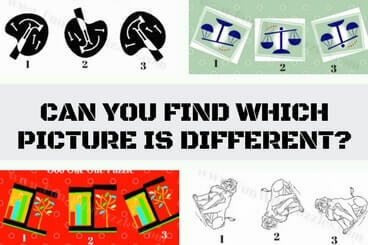 Which picture is Different in this Picture Brain Teaser? 4. Which picture is Different Brain Teaser? 5. Picture Brain Teaser to find which picture is different? 1. 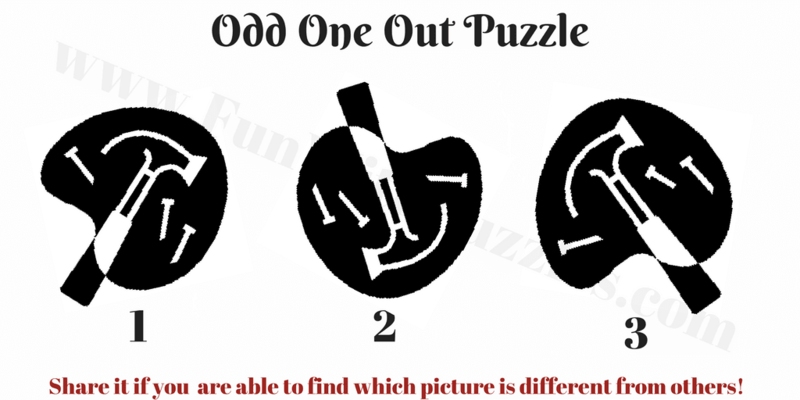 Brain Test to Find Mistakes in Puzzle Images: Give this Brain IQ Test which contains Picture Puzzles and Brain Teasers in which your challenge is to find the mistakes in the Puzzle Pictures. 2. Can you read this Encrypted Text? : Is your brain powerful enough to read encrypted or scrambled words in the sentences? Do check it out after giving this reading IQ test. 3. Spot the Difference Picture Puzzle: Here is the single Picture Puzzle in which your challenge is to spot the 6 differences in the given two similar looking pictures. 4. Naturally Hidden Objects Picture Puzzles: Last challenge is to find the naturally hidden Objects in the Puzzle Picture Images.